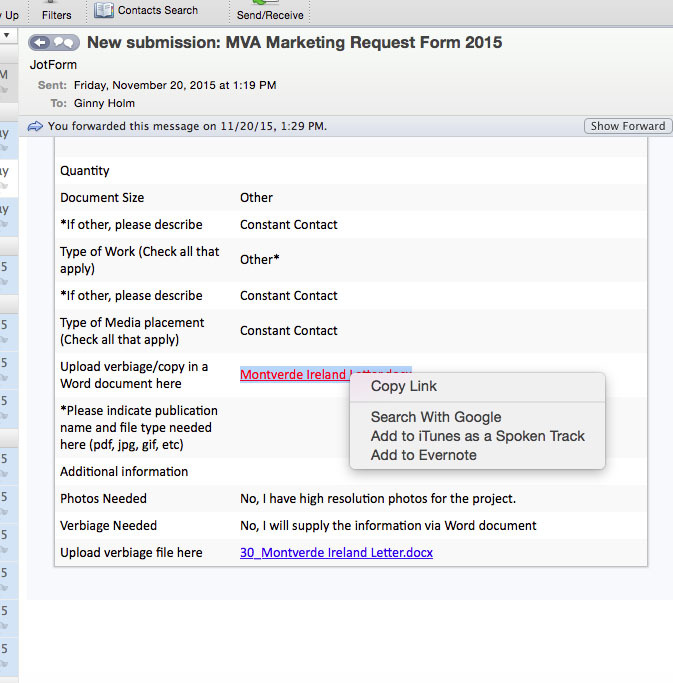 Submitted jot forms with doc.x attachments won't download onto my MAC. I use Outlook 2011 as my email, and Safari as my browser. When I prompt the attachment link on the submitted form, Outlook sends me a message asking if I want to open the file. When I choose Open, it says the address in not valid. It works fine on my coworker's PC, using Outlook. The issue is not caused by neither Outlook nor with the form. The error that you get is from Microsoft Word. What happens is that when you click on the link in the Outlook, instead of saving the file to the local temp folder and then sending the path to the Microsoft Word, it sends the link to Word. Since Word is not a browser, it can not open the file since for it the address is not on local nor external drive and as such it is not valid. To open docx file, please first save it on your Mac and then open it. You should no longer have that issue. If you follow the steps above you should no longer see the same. The only options I get are cancel and open. When I hit open it shows the message The address is not valid. So I can't save it and open it, it would be great if I could. 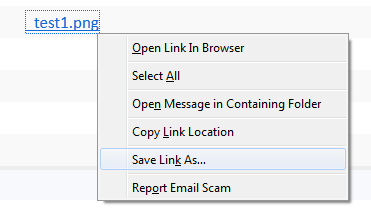 OK, in that case, please do right click on the link and select "Save As" or "Save Link As". If you do not have that option, please right click on the link (or press and hold the mouse button) and then grab a screenshot so that we can see what you are offered. I apologize, I was referring to the popup menu that is shown when you click on the link. On Windows and Linux systems, you click with the right mouse button on the link to see it. It should allow you to save the file in this way (the options that you will see are different since this is a screenshot of my ThunderBird). Unfortunately there is no option to save it there neither. I had presumed (since I do not have Mac), that you would get a menu as shown here: http://www.macinstruct.com/node/66 (second screenshot from the top). Which shows a popup menu with Download Linked File option. I will contact a colleague that has Mac to see if he has Outlook in which case he would be able to assist with this and tell us what he does to save the link. For now, the best way would be to use "Copy Link" option that you see and copy the link, then paste the same into your browser. Once you do that, the download should start right away, but if not, you can save the page instead on your Mac and then open it through Word. If I copy the link when I right click and paste it into the browser, it does not open the document. There must be an easier way that to save it to word and open it that way??!! I have moved your post to a new thread in order to properly assist you with the same. This is the link to your thread: https://www.jotform.com/answers/818816 and we will be answering it shortly.